The Foundling Hospital was begun at the height of the Gin Craze in London, a period in the early and mid 18th century when, according to a display in the museum, one in five houses in London was a gin shop. (Stop and think about that for a second. ONE IN FIVE.) The Gin Craze deserves its own post, really. (Indeed, gin has its own sort of museum here.) For now, suffice it to say there was an epidemic of public drunkenness, along with a whole lot of the sorts of activities that tend to go along with there being loads of desperate and incapacitated people hanging around: crime and prostitution. Many liken the Gin Craze and the public backlash against it to the 20th century's war on drugs, especially crack. 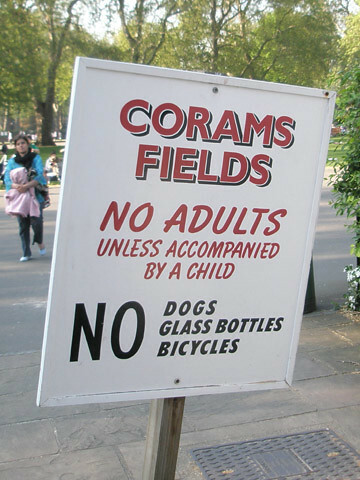 Naturally, and heartbreakingly, there ended up being a lot of abandoned children during this time, leading to creation of the Foundling Hospital by the kind-hearted and civic-minded Captain Coram. In the beginning children - generally only babies under one year old - were admitted without question, though admission requirements changed periodically. At times when demand exceeded capacity a mother might have to take part in a lottery to see if her child would be accepted. Drawing a white ball meant the child was in (pending a medical examination). A red ball put the child on a waiting list, and a black ball meant the mother and child were turned away. At other times any child offered up was accepted, though this led to terrible mortality rates due to overcrowding and the prevalence of disease among the unscreened children. Once accepted, babies were sent to wet nurses in the countryside where they stayed until they were four or five years old. Many reported this as being a very happy time in their lives, though some were ill-treated by their foster families and mortality rates were high. If the child survived, they returned to the hospital where they lived and were schooled until they were old enough for boys to be apprenticed or enlisted in the military, and for girls to enter service as housemaids. Being admitted to the hospital may have been far superior to being abandoned on the street, but don't imagine that life was all Little Orphan Annie for the foundlings. Certainly they were better off than if they'd been left on the streets, but mortality rates were still shockingly high. The museum displayed a register of children who'd been admitted, listing their names, date of admittance, and eventual fate. The page shown had six to eight names, and only two were listed as anything other than "deceased". Sometimes the mother would leave a token to identify the child so that she could come back to claim it if her circumstances changed. Later, written records like the ones I mentioned were kept and a mother would have to pay large (non-refundable) fee just to find out if her child was still alive. In the not-at-all-certain event that the child was still living, further fees applied for it to be released back to the mother. Unsurprisingly, this was exceedingly rare. 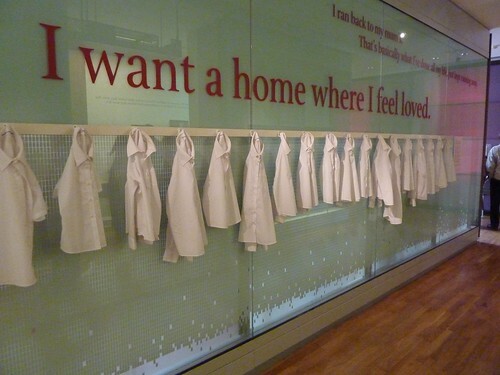 Life for the foundlings at the schools was harsh, but actually quite forward-thinking for the time. The kids all wore uniforms, rose early, washed in cold water, and ate quite a progressive diet, including having meat many days. Their education also included study of music, for reasons which will shortly become apparent. Medical care at the school was also quite advanced, with an emphasis on cleanliness and fresh air in medical wards. And small pox innocuations at the school are recorded as early as 1744, which is frankly astonishing. Sadly, "feeling loved" may have been a bridge too far for most foundlings. While their physical needs were met, it was a stern and disciplined place to grow up. No hugs. All of this progressive care cost money of course, and where the money came from is the other part of the story of the Foundling Hospital. 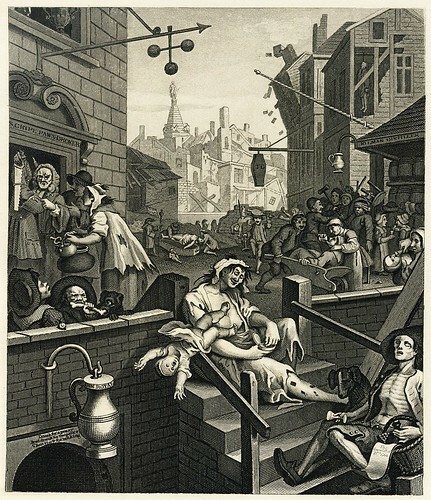 Thomas Coram was aided in funding the hospital by the patronage of two well-known artists of the time, the composer George Frideric Handel, and the painter William Hogarth (he of the "Gin Craze" etching above). Handel often performed "Messiah" at the institution, and was a governor of the school, where music became an important part of the curriculum. Hogarth and his wife were also patrons; they fostered children themselves and Hogarth donated several canvases to the school. Other artists also donated to the hospital, which amassed an impressive collection as a result, becoming, in effect, the country's first art gallery open to the public. Much of the Foundling Museum is now dedicated to displaying the collection, and the top floor also houses a display related to Handel, including Handel's Last Will and Testament and a complete score for "Messiah" that he bequeathed to the hospital in it. The hospital also benefitted from the Victorian penchant for Good Works of all kinds, and this, along with the patronage of popular artists like Hogarth and Handel, made the Foundling Hospital a fashionable cause, ensuring funding for its continued existence. The Foundling Museum was a bit unexpected. I'd been hoping for a lot more information about the hospital itself - the children, their life, the conditions at the time - and fewer rooms dedicated to big oil paintings. Instead, that interesting (to me) part of the museum was contained in just one room, with the rest of the building dedicated to the impressive collection of art and sculpture that I guiltlessly skipped over (though I did go have a peek at Handel's Will). Happily though, this left me plenty of time to make my way out to the East End to the day's second location: The Ragged School Museum. 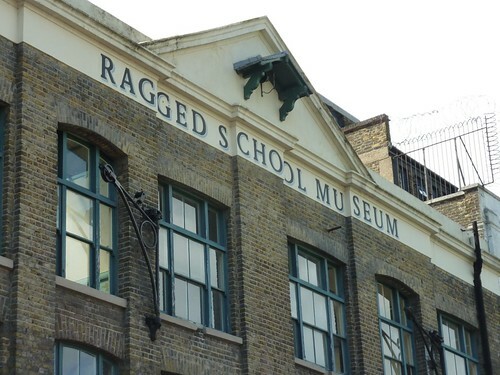 Ragged Schools were set up in poor areas of London to provide free education and hot meals for children in the 19th century, hence the name; the student were, quite literally, ragged. By 1867 more than 200 day schools were established, along with a similar number of evening schools (generally for adults) and Sunday schools. It's estimated that more than 300,000 children went through London's Ragged Schools in a forty year period in the mid to late 19th century. (The schools were eventually closed when local authorities took over education in 1902.) The Ragged School Museum is set up on the site of a Ragged School founded by the well known philanthropist Dr. Thomas Barnardo. (Barnardo's is now the UK's leading children's charity which, among other things, runs a decent charity shop in Brixton.) The museum is housed in an old industrial warehouse alongside the Regent's Canal, which is a pleasant walk from Mile End tube station, especially if one has just had a nice lunch and a good cup of coffee and the sun is shining. The museum is mainly geared to school children, 14,000 of whom visit each year to get a taste of what life was like for poor Victorian kids. 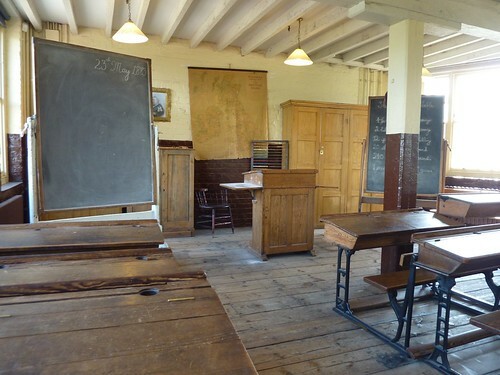 There's a classroom on an upper floor, equipped with real old desks and accoutrements, and visiting kids dress up in ragged clothes and draw on slates and have an hour long lesson taught by an actress in Victorian dress. There was a class of kids there when I visited, and I could hear them reciting back what the teacher was saying. She was trying to teach them the old pre-decimal pounds-shillings-pence system, which is hard going if you ask me, especially with farthings ha'pennys and bobs and guineas and crowns thrown in. Still, it looked like a great day out. Here's me in the classroom, contemplating how many silver sickles to a rouble or furlongs to a firkin or something like that. The floor above the classroom has a few small displays, again mainly geared to kids. The building itself is nicely restored and just a pleasant place to be. You can see the big windows that overlook the canal, and wide planked wooden floors, and it has a charmingly worn-but-scrubbed feeling and a clever two-tone paint scheme. Apparently, the chocolate brown colour on the lower half of the walls was Barnardo's idea and was designed to hide the marks left by small grubby hands. There's also a large room of displays about the surrounding East End neighbourhoods on the ground floor, and even a small gift shop. I lingered at the Ragged School. While the Foundling Museum was definitely more polished and must be better funded (judging by the £7.50 admission fee), the Ragged School Museum is a bit rough around the edges (and free!). You could tell that it's operating on a bit of a shoestring, and I sense that a lot of the people involved are volunteers (though their website does have a "Jobs" section, so someone must get paid for something). The museum itself came about when the building was threatened with demolition in the 1980s and local residents joined together to save it. And the guy at the front desk had the enthusiasm you usually only get see from volunteers; he chatted with me at length about the school, the building, and the surrounding neighbourhood. I really liked the place. Certainly, it seems to have an appropriately East End vibe, whereas the Foundling Museum felt very much like a place that still relies on wealthy patrons. I suppose in that way both places really are simply refections of their pasts. And with that tiny and unexpected bit of insight, I'm off again for another week. Phew! It was a long haul, but my show is finally really open. This means that I can go back to the indolent café-dwelling I mentioned last week. And while I did whine a bit about work, the truth is that it was only crazy every other day last week, which left me time to do a bit of exploring while I was out in deepest, darkest Suffolk. I was based in a small market town called Halesworth, population 4,600. Halesworth has a nice pedestrianised high street, a few good coffee shops, and a really cracking local hardware store called Cooper's, which is exactly the kind of place you want when you're trying to keep a sort of complicated but low budget show together. ("Right, what I need is ten metres of cheap garden hose, thirty-six M10 nuts, two plastic spring clamps, a handful of carpet tacks, and a package of hacksaw blades..."* God bless you, Cooper's!). However beguiling as Halesworth might have been (hint: not really at all, despite the best efforts of Cooper's, and a really good chip shop), there were the aforementioned days off, and I had my bicycle, so one day to took myself off to the seaside for a little break from the frenzy of Halesworth. 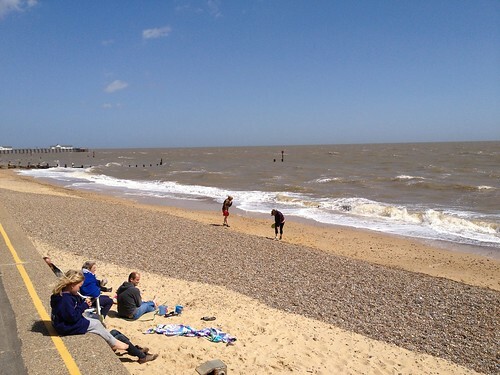 Southwold is even smaller than Halesworth (with a permanent population of merely 1,500), but it has the advantage of being on the North Sea coast, which makes it a popular spot for summer holidaymakers. It's got a pier, and a long stretch of beach, and the requisite ration of cafés, pubs, charity shops and twee stores selling postcards and expensive pots of jam. Southwold also has the good fortune to be home to Adnam's Brewery which is the town's largest employer and owner of 74 pubs around East Anglia. My trip to Southwold ended up being on an exceptionally windy day, meaning that wandering along the seaside, or paddling in the ocean were not really appealing. Though I did pause long enough to take a photo of some of the beach huts lining the seaside. A beach hut (also known as a beach cabin or bathing box) is a small, usually wooden and often brightly coloured, box above the high tide mark on popular bathing beaches. They are generally used as a shelter from the sun or wind, changing into and out of swimming costumes and for the safe storing of some personal belongings. Some beach huts incorporate simple facilities for preparing food and hot drinks by either bottled gas or occasionally mains electricity. The colourful beach huts at Southwold are typical of the species. The front doors open completely to create a wind break on either side of the large from porch. I even saw one in use, with a family huddled, in typically English fashion, enjoying a cup of tea. I'm sure they were utterly convinced they were having a lovely time. It's a really charming feature of the English psyche that they can sit in a 70 square foot wooden hut in 40 mile an hour winds with a cup of tea and a biscuit and genuinely believe they're having a nice day at the seaside. 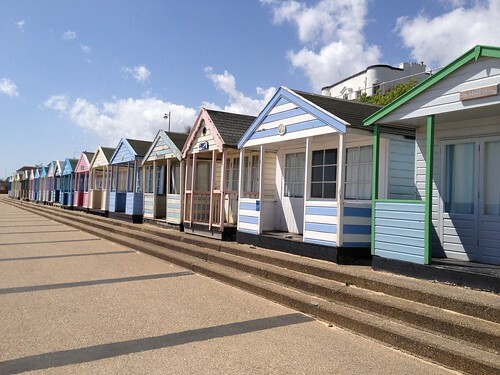 Beach huts are most common in the UK, but they also exist in France, Australia and South Africa. They're usually quite basic, and can be rented or bought outright. More elaborate ones on popular beaches can sell for ridiculous sums. In 2006 a beach hut in Dorset sold for £216,000. And I bet that didn't even include the biscuits. Southwold also has a lovely little building called the Southwold Sailors' Reading Room, which is open to the public, and free. Being a member of the public, and a cheapskate, I checked it out. 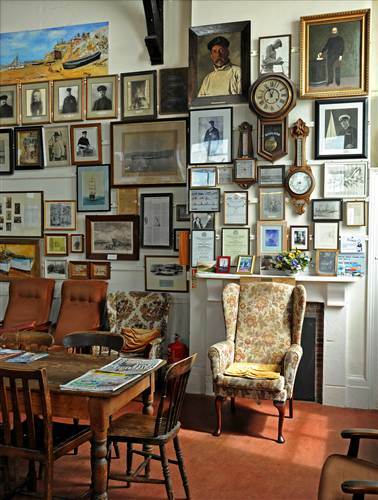 "The Southwold Sailors' Reading Room was built in 1864 as a refuge for fishermen and mariners when not engaged at sea, as an endeavour to keep them out of the pubs and encourage them in Christian ideals. 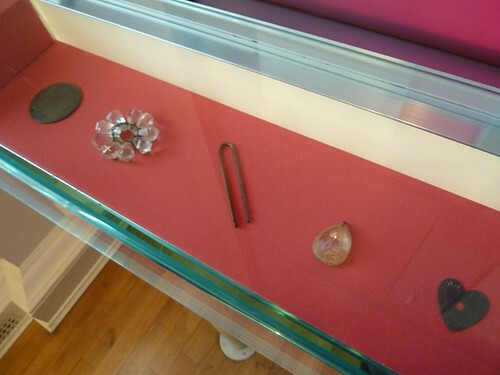 Displays of a seafaring nature line the walls and fill glass cabinets. 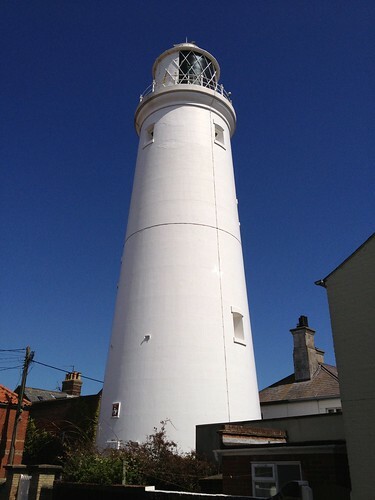 Pictures and portraits of local fishermen and seascapes, model ships and maritime paraphernalia offer a fascinating history of Southwold's connections with the sea." It's a small building absolutely rammed with maritime memorabilia, and was a quiet and charming refuge from the gale force winds outside. I had a short look around, deposited a pound in the donations box (I'm not really a cheapskate) and discovered that Southwold's seafaring history is perhaps not quite as fascinating as the good people at the Southwold Sailors' Reading Room might think. Interior of the Sailor's Reading Room. I imagine if you'd been out to sea for ages it would be quite a nice place to put your feet up and read a paper. Or, in fact, if you'd not been out to sea and were just looking for a way to get out of the wind. 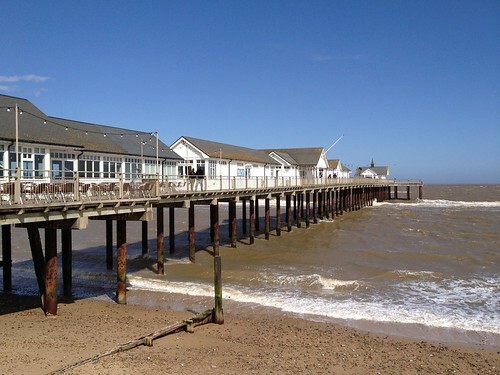 Being a small town, it doesn't take long to check out most of what's on offer in Southwold. I did the rounds of the shops. I had coffee and worked on the crossword. And I saw the lighthouse (closed on weekdays). I was just starting to despair that I'd be unable to amuse myself for the rest of the afternoon when I stumbled into the brewery district and happened on a door that purported to be the start point for the Adnam's Brewery Tour. Aha! A quick Google search indicated that the next tour was due to start in just under half an hour, which seemed like such good luck it would be downright churlish to ignore it. So I poked my head into a random office door, paid my £12 and nipped off for a quick picnic lunch before presenting myself for the 2pm tour. There's a long tradition of brewing in Southwold. And when I say long, I mean England-long, not Canada-long. The first recorded mention of brewing in the town was in 1345. So like I said… long. The Adnam's brothers founded their brewery in 1872 (no nearly so long, but still respectable). 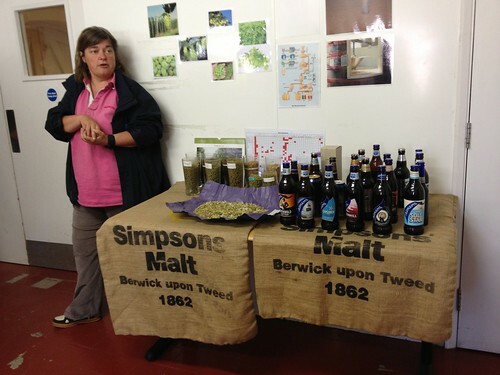 The tour started with a chat about the basic ingredients that go into beer - water, malt, hops and yeast. We got to taste several of the different grains that go into Adnam's malts, which were actually quite nice on their own. I would happily munch on a few handfuls of toasted, malted barley alongside my pint. We went through all the parts of the brewery, most of which are just big rooms filled with stainless steel kettles. Adnam's are actually quite environmentally advanced about their brewing. In 2006 they built a new eco-distribution centre just outside of Southwold, which has a living roof, lime and hemp walls and rain harvesting facility. In 2007 they reduced the weight of their 500ml bottles from 455grams to 299 grams, making them the lightest bottles in use. And in 2008 they converted all their old kettles to new German models that capture the escaping steam and recycle it back into the kettles themselves, which saves about 30% of the energy in the system, but has the unfortunate side effect that Southwold no longer smells like beer all day. They've also streamlined how much water it takes to make their beer. Conventional brewing takes about 6 pints of water to make one pint of beer, which seems like a pretty good deal to me, but Adnman's have reduced that to 3.2 pints. All in all, they seem to be doing good work. The only downside I can see (besides the lack of beer smell) is that they had to retire their dray horses when the eco-distribtion centre opened. Until that time, they still used horse-drawn carts to deliver beer to the various pubs inside Southwold. Sadly, the new distribution centre is too far for the horses. Naturally, the tour ended with a beer tasting, where I had to be careful to remain in a fit state to cycle the eight miles back to Halesworth. 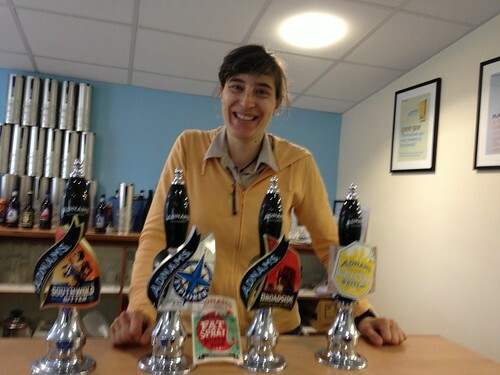 However I did have a small taste of four or five different brews, and had my picture taken behind the pumps. Me behind the pumps, slightly out of focus, which should not be taken as an indication of my level of sobriety, but doesn't exactly reflect well on the photographer, a slight woman who had the temerity to go on a brewery tour despite the fact that she didn't really like beer. After that there was just enough time for a quick trip to the pier. I walked the whole length, even though it was so windy that I was in imminent danger of being blow approximately to Rotterdam. An English seaside pier is a sort of peculiar thing. Originally built as landing stages for ferries, English piers are long walkways usually supported on wooden posts. The most famous piers in England are in Brighton and Blackpool, where the structures support amusement arcades and restaurants and shops and lots of twinkly lights. The Southwold pier is more modest, but still has an arcade full of coin-operated video games and claw grabbers, and those ones where you put a coin in to add to a pile of coins that are eventually supposed to spill over a precipice and reward you with… more coins. But Southwold pier also had a fantastic "Under the Pier" show, which was a misnomer, because it really wasn't under the pier at all. It was, however, positively excellent. Normal pier games take your money with the chance of rewarding you with something of nominal value. The Under the Pier show is a collection of home made machines that are utterly ridiculous. Take, for instance, the Rent-a-Dog. 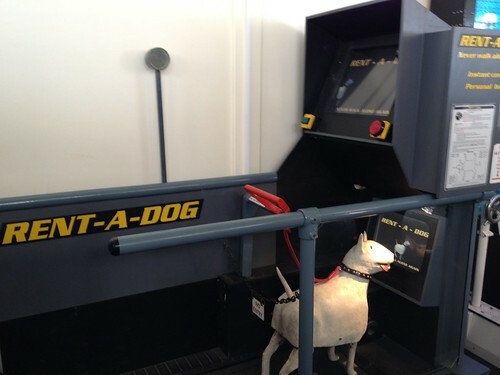 Put in your 40p, step onto a treadmill, grab the leash and… walk the dog. Brilliant. Rent a dog. You watch the street pass by on your screen... the dog watches on his! There was also the Mobility Masterclass - a simulated street crossing complete with aluminium walker. Or the Instant Eclipse - sit in a dark booth and watch the stars come out. Or the Autofrisk - a set of rubber gloves that give you a thorough frisk. In all there were about 20 silly machines. The Under the Pier show really was excellent, and a fitting end to my day at the seaside. Once I'd had a thorough look at all the machines, there was nothing to do but hop on my bike and head back to the hustle and bustle of Halesworth, secure in the knowledge that I'd partaken in all that Southwold had to offer, but slightly wistful that my trip home wasn't accompanied by the sweet smell of fermenting malt. * That's my actual shopping list, over the course of a week. Cooper's really was a gold mine. I could also have posted a letter, and bought a slow cooker, or bedding plants, or a set of patio furniture. Gosh it's been a while, hasn't it? Sorry about that, but I've been really busy. You may recall the expended period of unemployment that followed the finish of my work on last year's Olympic ceremonies. Well it turns out that freelance production management work in London seems to operate on the same schedule as the buses. That is, you wait ages for one to come along, and then two arrive at the same time. In my case the two were gigs for Soho Theatre and Hampstead Theatre. The schedule was not ideal, with the tech period for the Soho show starting a mere three days after the Hampstead show opened. This meant that I spent most of April in a sort of mad haze dashing from theatre to workshop to theatre and back. And with this size of theatre production management is very much a hands-on affair, which resulted in a fair bit of time lifting heavy things on and off trucks or standing at the top of a ladder tangled in miles of black string or cursing an M10 nut that had rolled just out of reach under a dusty bit of deck, in the dark. Luckily for me the end is in sight and I hope to return to my former life of indolent café-dwelling in about a week or so. 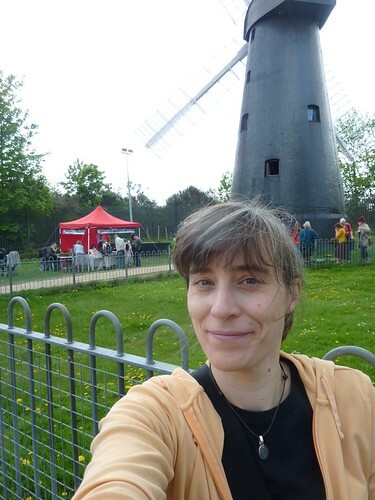 Luckily for you I've actually had one or two days off in which to do blog-worthy things, some of which were far-flung, and some of which were almost in my own back yard, like the topic of today's long-awaited return to blogging: Brixton Windmill. No really, it's an actual WINDMILL. Not exactly a carpet of bluebells. Brixton Windmill was built in 1816 and leased by a Quaker family - the Ashbys - who used it to mill stoneground flour for a couple of generations. By 1862 the increased density of building in the area reduced the amount of wind available, meaning the mill was no longer functional. It remained dormant until 1902 when the Ashbys returned and equipped it with a steam-powered Provender Mill, a tiny device that could produce as much milled grain in a day as the wind-powered mill could, and could do it consistently. The mill ceased operation in the 1930s and the sweeps were taken down. In the 1950s it was listed as a Grade II property and a small park was laid out around it called Windmill Gardens. 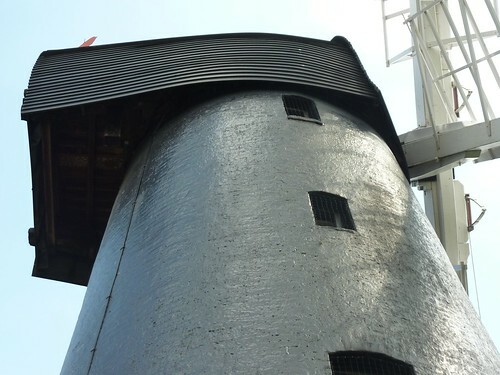 The windmill itself was partially restored in the 1960s, with the sweeps reinstated. However, it continued to decay and was vandalised and somewhat forgotten until it was officially recognised as being "at risk" in 2002. In 2003 Friends of Windmill Gardens were set up to try to restore the windmill once again. They campaigned for and won lottery funding and the restoration work tool place in 2010. The newly restored windmill was opened in 2011, and holds regular Open Days, one of which was on the aforementioned sunny Monday. I like to call this one "Sunlight on Gears"
My tour guide, Robert, was quite knowledgeable, and explained how the mill worked. In brief: wind turns sweeps, turning sweeps cause grindstones to spin, grain between stones gets ground. However, there's a lot more to it than that. First of all, getting the sweeps to catch wind is a bit of a production. 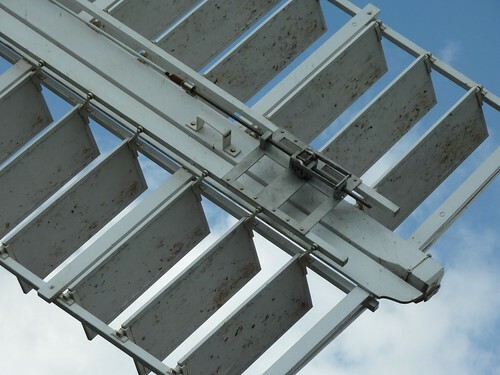 The Brixton Windmill has sweeps equipped with two kind of sails: common sails and patent sails. Common sails are an open lattice work that have to be covered with a big bit of canvas in order to catch the wind. This means that the miller would have to climb the sails themselves to rig the canvas, which was a bit of a pain. One of the common sails, unrigged. The general annoyance of dealing with common sails lead to the development of patent sails. 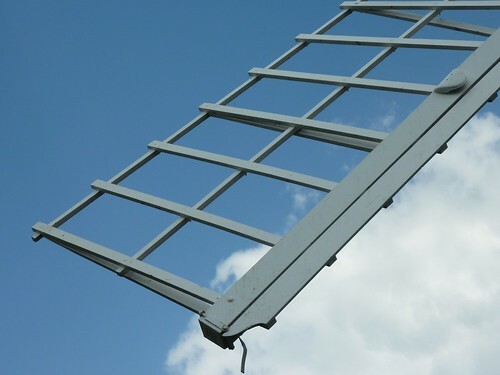 Patent sails are equipped with a set of hard louvres that could be opened or closed with a hand crank and are therefore way easier to deal with than the common sails. Sadly, patent sails are not nearly as good at catching wind as common sails, which is just typical, isn't it? That's why the Brixton windmill has two of each type. The sails are attached to the cap of the windmill, which looks a bit like an upturned rowboat and sits on top of the windmill. The cap cap actually be turned from the inside (with gears!) which allows the miller to orient the sails to the wind. The cap of the windmill. 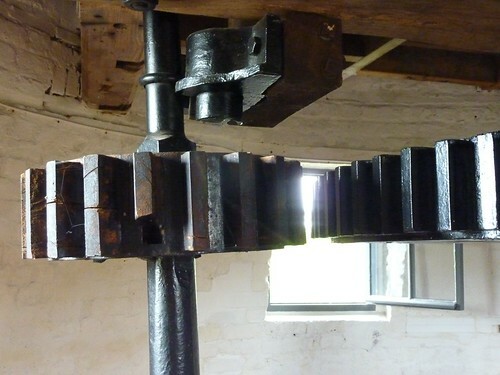 Once the sweeps are turning, the shaft of sweeps spins and that horizontal spinning motion is converted vertical spinning motion with - you guessed it - gears! 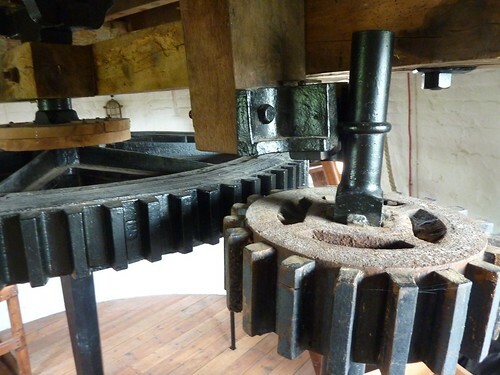 The vertical spinning shaft is attached - a few floors down - to the millstones. 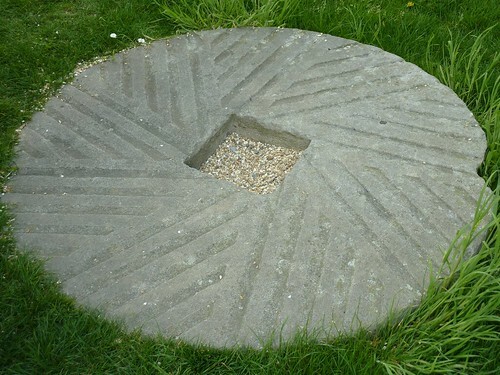 The unmilled grain is poured through a hole in the top stone (called the runner stone), and is ground between the top stone, which spins, and the bottom stone (called the bed stone), which stays static. The resulting flour works its way out to the edges of the stones and is collected. (And in a wordy aside: any unmilled grain is called grist, as in the phrase "it's all grist for the mill".) The resulting flour could be milled again to produce a finer grind. And the stones themselves are actually cut in a pattern, which also affects the grind. 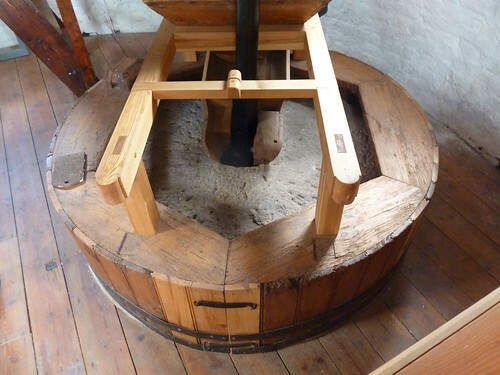 Sometimes mills would even be equipped with two sets of stones to mill two kinds of flour, all driven from the same central shaft through the power of gears! As I mention earlier, the mill was revived in 1902 when the Ashbys returned and equipped it with a Provender mill. A Provender Mill is a small, freestanding cast-iron device invented to mill grain without the need for giant buildings with unwieldy sails. It's somewhat ironic that the Ashbys chose to site their Provender Mill inside the old windmill when they could just as easily have put it in a warehouse or a barn. Maybe they missed all those nice gears. 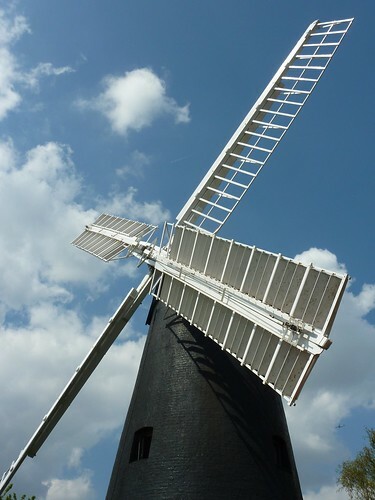 The Friends of Brixton Windmill are hoping to get the provender mill running again so that they can actually produce flour, but they're running into money problems and Elfin Safety issues and such. Still, they're hoping to get grinding again by 2016, which is the mill's 200th anniversary. 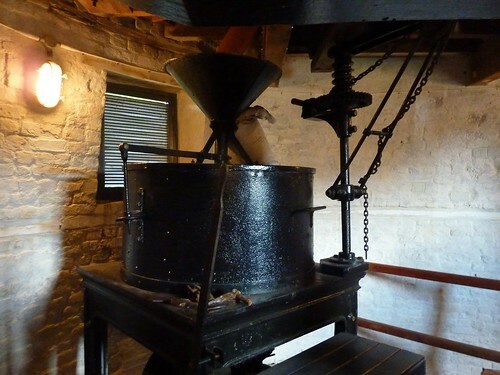 The provender mill, which originally ran on steam power, and then on gas, and has now been converted to run on one tiny little electric motor. 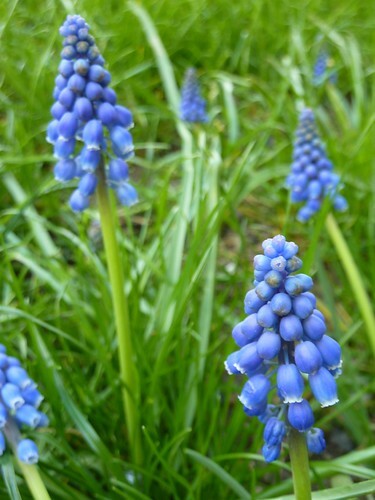 Boringly, most of its gears are small and hidden. The actual tour of the windmill only took about 45 minutes, and the surrounding festivities - a slightly sad tea room and bake sale and a somewhat ragtag group of musicians - were not overly compelling. Still, the place was full of people enjoying the sunshine, and kids frolicking in the adjoining playground, which I'd say is largely due to the drawing power of a really nice big bunch of gears. Me, and a bit of the windmill in the background.